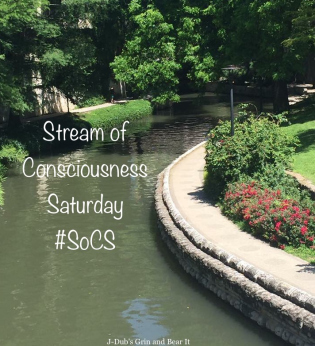 You’ll not believe it is Stream of Consciousness Saturday time again. This week’s prompt is “yule/you’ll/Yul.” Linda Hill says to start the post with one of them. Now you know why the first sentence was so goofy. If you would like to join this band of misfits, visit Linda’s blog and read all about how. Here is the link. Great job, John! I had Yul Brynner in my head from the start. 🙂 Happy Saturday! Happy Saturday to you, Jill. *sung to the tune of Silent Night by Nat King Cole. If that’s Santa, that boy’s in a heap of trouble. Where’s Tiny, the kickboxing reindeer when you need him? Ha!!! I can’t top Dan’s comment. But I do hope for a story about Tiny, the kickboxing reindeer. Merry Christmas, guys. Hugs. You’ll keep us wondering as we watch the Yule log burn if Yul is joshing or not. 😀 Thank you for the morning chuckle, John. As always, great job. I was so ready to write about how nice it was and then that last line came. Good one. Permanently naughty. A nice way to live. That went downhill fast. Maybe there’s a bailbondsman’s card in the wallet. Ha ha ha. Downhill is a fast ride for sure. We had an Uncle Yuletide in our Christmas Program. This was funny…another wallet is ideal this time of year. You’ll enjoy the Yule with Yul, AKA John Howell! Ha hah a. Thanks, Billy Ray. John W. Howell, the King of twisted endings. 🙂 Creative, as always! That is soooo bad!!! Funny though! Thanks, John! Merry Christmas! The laugh is worth the bad taste. Good one John, lots of Christmas cheer your way good sir, hope you have a great Christmas and best wishes for 2018. Thank you, Michael. Best Wishes for 20118. Merry Christmas.